The other night, we had a couple of our friends over for dinner. They're expecting their first child, a daughter named Lily, in September and we couldn't be more excited for them! Ever since we've moved to the suburbs, they have been great friends to welcome us into suburbia in so many ways and we were happy to introduce them to our little man. For dinner, I prepared this quick recipe for Mustard, Herb & Cheese Crusted Pork and it was a hit with no leftovers to be seen! The recipe for Mustard, Herb & Cheese Crusted Pork is a combination of two different pork recipes. 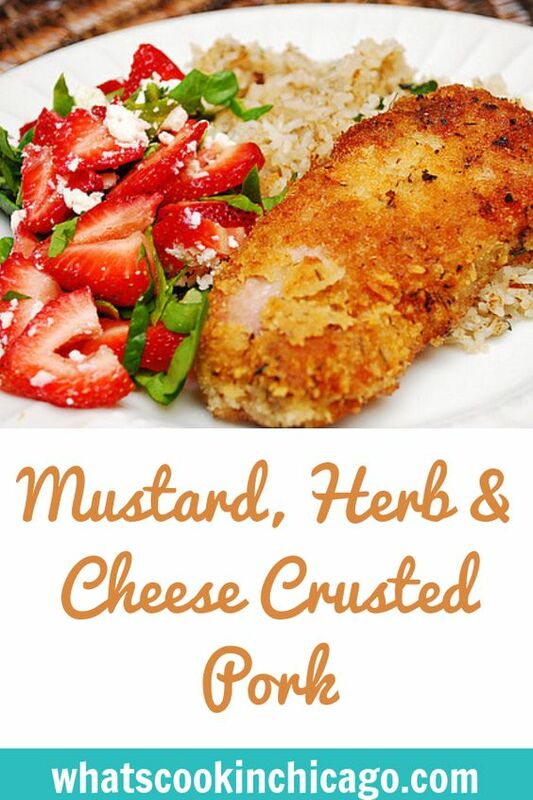 I used the herb combination of one recipe and the mustard coating of another to impart additional flavor. Since I didn't want to prepare something that took too long in the oven, I sliced a pork loin roast into individual slices and coated them with a crunchy panko breadcrumb and Romano cheese crust. I thought the added breadcrumb and cheese crust made for a better presentation and added some nice texture. 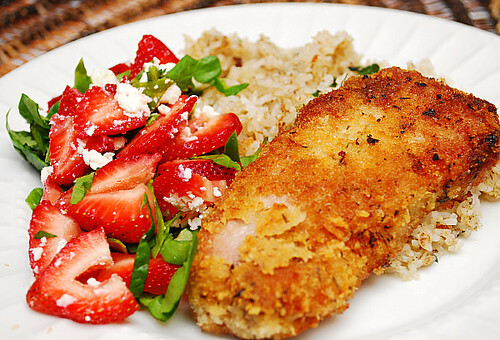 I served this dish with a toasted garlic rice pilaf and a strawberry spinach salad. This guest friendly dish can be made in advance and frozen as well, a bonus if you want to have a quick meal for busy nights. Preheat the oven to 350 degrees. Heat oil in a skillet until hot. Combine the all herb mixture ingredients in a small bowl. Brush the herb mixture onto the pork loin slices, covering all of the meat and fat. Combine the coating ingredients in a shallow dish and dredge coated pork loin slices to coat completely. Pan fry the coated pork loin slices until browned. Place browned pork on a baking sheet and bake in the preheated oven for 5-7 minutes. Test for doneness using an instant-read thermometer. When the internal temperature reaches 155 degrees F, remove the pork from the oven. * To make ahead/freezer meal - Following the directions above and freeze pork after coating pork slices with panko breadcrumb mixture. Place in an oven- and freezer-proof baking dish covered with foil/lid or gallon sized freezer bag and freeze.When ready to prepare, pan fry from frozen until browned. Bake in preheated oven for 7-12 minutes. Test for doneness using an instant-read thermometer. When the internal temperature reaches 155 degrees F, remove the pork from the oven. cheese in the crust? you can't go wrong with that. Hey Joelen, hope the little man is doing well and you too! I know you're super busy right now, but if you have a chance if you can share that wonderful strawberry salad in this photo that would be awesome - I'm in love with that photo - and I think i can tell what's in it but not 100% sure I could get the more subtle ingredients. @Stephany, the strawberry spinach salad is pretty easy with only 3 ingredients - baby spinach (which I cut into shreds or strips), sliced strawberries and crumbled feta cheese. I served this with a poppyseed dressing. Crusted + Cheese = Genius! Looks beautiful! I love to see all the things you make, and congratulations on the new addition to your family. I hope you are getting some rest! This recipe looks delightful. Thank you for posting and making me hungry. When I tried browning it all of the crust just came right off! Any tips to prevent that? Wishingforrain - sorry the crust didn't work for you. Alternately, you can place on a baking sheet, drizzle with some melted butter and bake. I've also made this in an oven proof skillet. Just transfer everything into the oven and less dishes to clean! I've never heard of panko bread crumbs, and I'm not sure I can get them where I live (I'm in Switzerland). Can I use regular breadcrumbs instead? BSR - Panko breadcrumbs are Japanese style breadcrumbs that produce a really crisp breading when used. If they are not available in your area, feel free to use regular breadcrumbs in place of them.